You now have a submarine! Time to explore. The expanded underwater world is a bit different from the second world you visited, though not by a huge amount. Though you don’t need to go underwater to reach the town anymore, Moore still appears as a blip on the underwater world map. The town is virtually no different than before, with one exception. In the southwest corner of town is a small shed you can walk through from behind. It will take you into an invisible path through the forest. … or it would be, if you didn’t have a seven minute timer in place. Once that time runs out you’ll suffocate and game over. There are two chests on the way down which will reset the timer to seven minutes, though in order to reach the bottom they’re hardly necessary. At the bottom you’ll find something you probably forgot all about: the crystal shard that got left behind when the Tower of Walse sank. Guarding it is a boss. Gogo is a mimic, and he revels in watching others follow his path. Consequently, the way to beat this guy is to do absolutely nothing, because that’s what he does. Just ignore the game for a few minutes and he’ll eventually chime in and declare you a winner. When that happens the battle will end and you’ll receive the Mime crystal shard. Despite this odd path to victory, you can attack Gogo if you want. It is not a good idea. 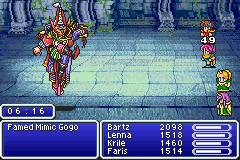 Gogo is perhaps the strongest boss in the game, and he’ll retaliate with some absolutely ridiculous spells to punish you for your transgression. It is possible to beat him, but you need to have ridiculously high levels. He’ll also pull out some especially painful spells just as he’s dying in a last-ditch attempt to finish you off, so you need to do so much damage that this doesn’t happen. A very difficult task, this, and not worth the effort unless you want the extra challenge. There’s an enormous bay in the middle of the world. Put down in it and sail northeast. Just south of Karnak you can dip into the water and find a small cave. Inside is Mr. Clio, a psychic who will provide you with stats about your game. None of them are particularly important, but they’re an interesting glimpse at how far you’ve come.